One of the crucial features of MuscleXP Raw Whey Protein is that each scoop of this product contains 24g protein without any added sugar. Whey is considered effective primarily due to the fact that it is more easily absorbable than most of the other protein-containing food and supplements. It is also easily digested. For these reasons whey has become a leader in the category of preferred protein supplements that are sold today. Each serving of whey provides 4g of L-Glutamine as well as more than 5.15g of BCAAs with entire set of amino acids. This concentrate contains 80g of pure whey protein in every 100g serving. Why use MuscleXP Raw Whey Protein Concentrate 80% Unflavored, 1Kg (2.2lb)? Flavored protein powders are not liked by a number of people who want to pair the powder with a different recipe of their choice. Thankfully, MuscleXP Unflavoured Whey Protein Powder gives users the freedom to create numerous flavour combinations. This will give you the liberty of adding strawberries and bananas on one day, and maybe raspberries and blueberries on the next day, depending on your preference. 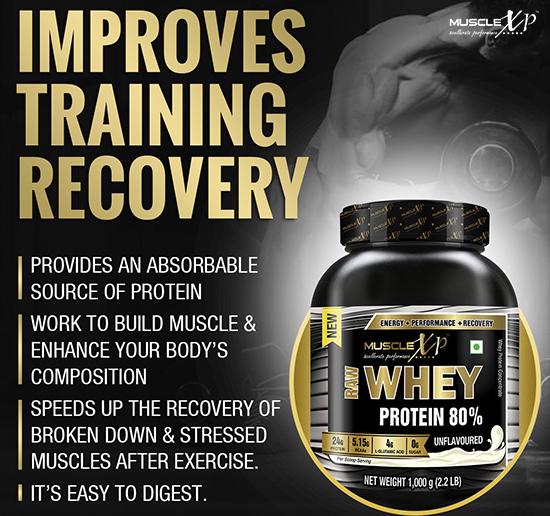 It is now possible to take your fitness to a higher level with the MuscleXP Whey Protein Supplement. This superior quality unflavoured whey protein has been created to provide what you desire. It is devoid of gluten as well as sugar. The whey used here has been imported from the USA. Whey protein is a quick-digesting protein that promptly provides amino acids to the muscles and neutralizes muscle breakdown. A majority of experts have also advised intake of a top-quality whey protein shake, like Whey Protein, immediately after waking up in the morning. Possibly the most vital time for sportspersons to consume whey protein is soon after their workout. This is due to the fact that the muscles having been subjected to a great deal of stress now need nourishment for re-growth. A quick-working protein source like whey protein is the ideal option in such cases. Whey protein concentrate is an excellent source of protein that helps build muscles. The quality of this product is really good. Blends easily with smoothies. I feel full and energized after taking it. This is undoubtedly one of the best whey protein concentrates. Since it is unflavored, I can add it to any smoothie recipe. It is energizing and filling and excellent source of high quality protein. Excellent whey concentrate. Can be easily combined with any post-workout recipe for elevating energy level. Good for muscle development. Top grade whey. Great protein supplement for people who need extra protein. I’m taking this for a month and satisfied with the result. This is the best quality whey for post workout shake. I find this filling. It re-energizes me and also supports muscle recovery. Dissolves easily in both water and milk. Good quality whey. The perfect protein supplement for development and maintenance of lean muscles. The quality of the whey is excellent. It makes me full and energized. I need extra protein for increasing muscle mass and healthy body weight. This whey protein supplement is helping me. Take around 1 heaping scoop (30g) of whey protein powder and add it to 200ml of cold water/fat-free milk/any liquid base of your liking. Blend it for 45 seconds to obtain a smooth and creamy protein shake.